There are numerous popular tourist destinations in Tokyo, but even the most seasoned traveler needs a break here and there! Enter the various cafés and sweet shops scattered around the city, where visitors can snack on sweet treats. Whether they're traditional or newly trending, these 10 shops chosen by Trip101 are sure to satisfy! Fruit De Saison is located about seven minutes from Akihabara Station, and is a sweets store where you can savor fantastic parfaits. There are various seasonal menus items, such as the strawberry parfaits during December. The deluxe parfait has huge, high-quality strawberries atop luscious cream. 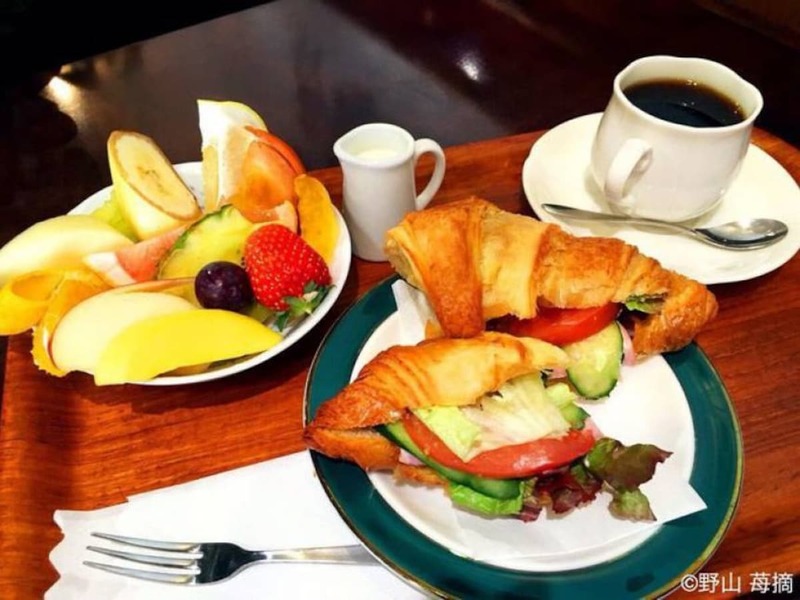 Apart from the parfaits, you can also enjoy the croissant sandwich set (shown in the photo), which comes with a fruit salad, red tea and (of course) the marvellous croissant sandwich, plus a mini parfait for dessert. This makes Fruit De Saison the perfect place for lunch! Kanantei is an eatery located near Shibamata Station, where you can enjoy a wide variety of Japanese cuisine, including eel, ramen and much more. There is also alcohol available. At first sight it seems like just another typical eatery found in Japan. However, Kanantei is also famous for its mukashi anmitsu. Anmitsu is a Japanese dessert with agar jelly served in a bowl of red bean paste, boiled peas and fresh fruit. The mukashi anmitsu comes with black sugar syrup that you can pour over for a wonderful harmony of sweetness. Kanantei is a terrific place for lunch or dinner, or even just a quick pick me up. Frutas (as its name implies) is most-known for its fruit-based sweets. The most popular choice on the menu is the fruit parfaits. Various fruit parfaits that change with the season are available at Frutas, such as the cherry or peach parfaits, which can be enjoyed during summer. If you visit Frutas in the winter, you will be welcomed by the amaou waffle, as shown in the photo. It is a luxurious waffle topped with delicious strawberries, maple syrup and a rich custard sauce. Akasaka’s streets are filled with various buildings catering to the latest trends, such as Akasaka Sacas and Akasaka Biz Tower. Located in this area is Patisserie De Limmo, a sweets store with a wide variety of choices. One of the most popular dishes there is the soufflé pancake. Shown in the photo is one of the pancakes, which are called rikyu, with matcha-chocolate cream, red beans and shiratama dango (Japanese rice dumpling) all on top of a chocolate soufflé. 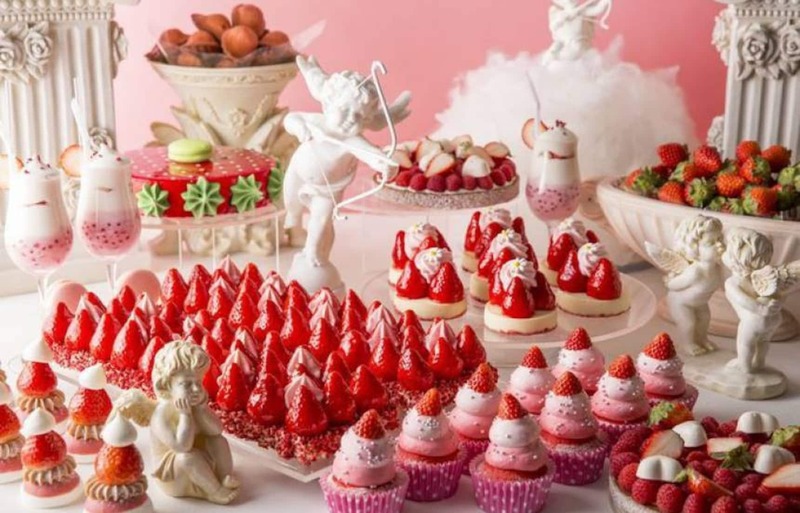 There are also other sweets, such as parfaits and macarons, available. During lunch hour, you can also enjoy a quiche set, which comes with salad and soup. The Kiyosumi Shirakawa area in Tokyo is famous for the variety of cafés and sweets stores that line the streets, as well as the beautiful Japanese-style garden, Kiyosumi Garden. Located in the Kiyosumi Shirakawa area is a sweet shop called Brigela, which specialises in a unique way of eating gelato. "Brigela" is a combination of "brioche" and "gelato," in which cold gelato is sandwiched in a hot brioche. An amazing 16 flavors of gelato are available at Brigela, the most popular of which is yogurt. There are also fruity flavours, such as pineapple and orange. Apart from enjoying the gelato Brigela-style, you can also have it without the brioche as well. Brigela is an extremely popular shop that is often seen with long queues, so budget a bit of time if you plan to visit. Kibidango is a type of dango (a Japanese rice dumpling) that originated in Okayama Prefecture in the 19th century. Kibigoya is a retro shop reminiscent of the Showa period (1926-1989), and Japan's yesteryear. It only sells two types of Japanese sweets: kibidango and warabimochi, a Japanese dessert made with mochi. The freshly-made kibidango and warabimochi are coated with kinako (toasted soybean powder), and the soft, sweet texture is sure to leave you hungry for more! For the other enticing entries on the list, read the full article from Trip101 via the link below.